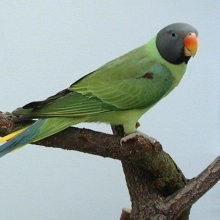 Description: Green; head dark grey with slight bluish hue; black stripes to cheeks and narrow band to nape, with adjoining bluish-green band; dark red patch to wing-coverts; under wing-coverts greenish-blue; middle tail-feathers blue with green base and yellow tips; upper mandible red with yellow tip, lower mandible yellowish; iris whitish; feet grey. Hen without or with greatly reduced dark red patch to wing-coverts. 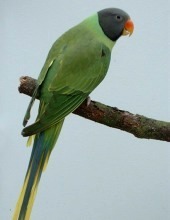 Immatures with greenish head and brownish-green cheeks; narrow green band to nape; upper and lower mandible horn-coloured with brownish base to lower mandible; adult plumage attained at 30 months. Length: 40 cm, wing length 158 - 178 mm, tail lenght 192 - 243 mm. Distribution: Eastern Afghanistan to Northern India, Assam North of Brahmaputra, Nepal. Description: As himalayana, but generally more yellowish; head less bluish; black stripes to cheeks and narrow band to nape, with adjoining bluish band, brighter than himalayana; under wing-coverts dark bluish-green; middle tail-feathers violet-blue with yellowish-white tips; smaller, but tail almost as long as himalayana. Length: 36 cm, wing length 140 - 152 mm, tail length 187 - 276 mm. Distribution: Southern Assam, Burma, Northern Thailand, Laos, Vietnam and Northern Yunnan, Southwest China. Habitat: Forest between 650 m and 3,800 m; in localities also down to 250 m; prefers oak, cedar and pine forest; open wooded terrain; cultivated areas with tall trees; dry bushland; secondary forest; regularly raids fruit plantations and rice fields. Status: Common in localities, but scarce in wide areas of distribution area. 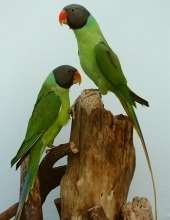 Behaviour: In small groups of 4 to 6 birds outside breeding season; gathers in evening in larger flocks; in some regions seasonal migration between latitudes; in winter flocks withdraw to lower latitudes; noisy and conspicuous; in some localities associates with Plum-headed Parakeets (Psittacula cyanocephala), Blossom-headed Parakeet (Psittacula roseata) and Ring-necked (Psittacula krameri); flight swift and straight; flocks fly effortlessly and with sharp turns through trees to land in highest branches. Call: Call high-pitched screeching or much softer, melodious chattering. Natural diet: Seeds, nuts, fruits, berries, flowers and leaf buds; causes considerable damage to walnut, apple and peach orchards; observed picking up grit from dried-up river-bed. Nesting: Breeding period in India and Afghanistan from March to May; in Burma from January to March; mostly occupies woodpecker holes in branches and dead trees; colony breeding recorded; up to three pairs in one tree; clutch 4 to 5 eggs; incubation 24 days; fledging period 40 days; egg measures 28.3 x 22.2 mm. 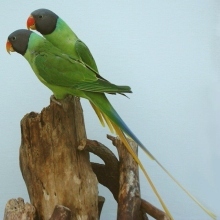 Aviculture: Medium-noisy parakeet; active; acclimatise newly imported birds carefully; later hardy; initially shy, soon calmer and confiding; not hard chewer; susceptible to cold, wet conditions; can be housed in communal aviary with smaller birds; immatures susceptible in first year. Accommodation: Outside flight 3 x 1 x 2 m with adjoining inside area; minimum temperature 5°C; during acclimatisation period 20°C. Diet: Seed mix of sunflower, safflower, wild bird food, buckwheat, various millets, canary seed, oats and hemp; millet spray (also sprouted); fruit (apple, berries, orange), greenfood (dandelion, flowers, chickweed) and vegetables (rose-hips, half-ripe maize, carrot, sweet pepper, cucumber); eggfood and biscuit for rearing; provide immatures with regular vitamin C supplement during first year. Clutch: 4 - 5 eggs. 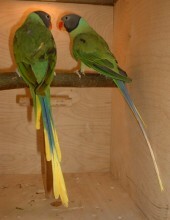 Breeding: Frequently achieved; nest stump of 25 cm internal diameter and 60 cm tall; breeding begins mainly in April; clutch 3 to 5 eggs; incubation 23 days; fledging period 7 weeks; young independent 14 days after leaving nest; few times hybrids between the subspecies is achieved which is not advisable. 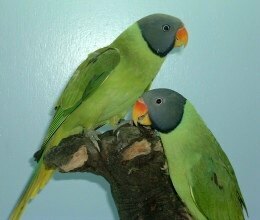 Mutations: A Lutino mutation has been achieved of the sub-specie Psittacula h. finschii. All photographs are copyrighted by their respective owners.